This is Mental Health Awareness Week (16-22 May) and Mental Health Foundation is promoting the week and this year’s theme is relationships. 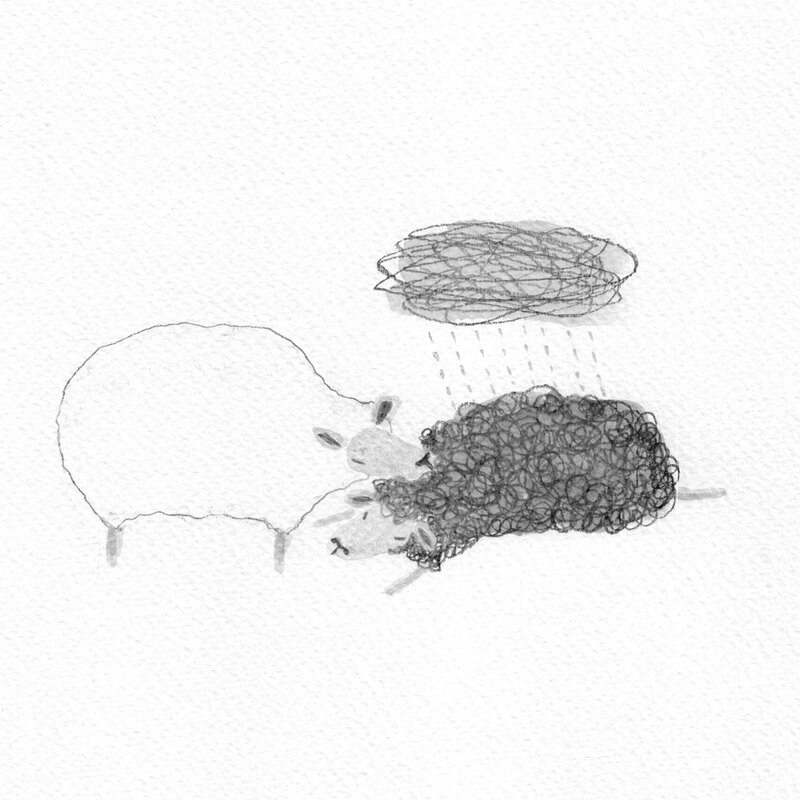 In this post, I’d like to talk about my relationship with my elder and only brother and why I drew this sheep illustration. Since we were small, my brother and I were very different, like yin and yang. While I was jumping and spinning with my friends on the stage for our ballet concerts, my brother spent most of his time in his room alone, reading comic books. We continued growing up in that way. Our relationship were never close, but not in a negative way. We had so little in common and we’re just happy to leave each other alone, minding own business. When my brother was in high school and university, he was a typical otaku. (Otaku is a Japanese word for ‘geek’ but with much more unattractive connotation.) He was also semi-hikikomori (a Japanese term for adolescents or adults who withdraw from social life). When our dad died (I was 16 and my brother was 19), my brother was helpless. He couldn’t even go into the hospital room where our dad lay in coma. During dad’s funeral, I expected my brother to stand up and support our mum but he couldn’t. I, as well as our granddad and uncles, thought he was a wimp. After our dad’s death, I felt a responsibility to be strong for our mum because I thought my brother was weak. While I moved to UK and got degrees and jobs, my brother finally got a part-time job at a local library with a little help from our grandparents. However, he showed no motivation to be full-time and he continued depending on our mum financially. It annoyed hell out of me. A five years ago, our grandparents died almost at the same time. When I went back to Japan for their funerals, I noticed my brother’s strange behaviours. First, I overheard him talking aloud as if talking to someone else although he was alone in his room. Then, at the funerals, I saw him mumbling to himself at the corner of a room. He kept looking at the floor while greeting the guests, and, as the funeral went on, his back hunched down and down and his face twitched as if he was in pain. I got an alarming feeling. Something was clearly wrong with him. I asked my aunt what’s going on with my brother. She took me to a quiet corner, then told me that my brother had been taking medications for his depression and other minor mental heath problems for years and that my mum had kept it secret from me because she didn’t want to ‘burden’ me with family issues while I was abroad. It hit me like a massive slap in my face, then I was petrified by the strong sense of shame and regret of my own ignorance. The revelation didn’t change our relationship dramatically, like going to a road trip together or something. We still leave each other alone. However, I feel we got a bit closer. I realised what I had mistaken as his weakness was his sensitivity. The realisation changed how I see my brother. Now when I look back, there are so many small yet kind things he did for me despite the hardship he was going through. Now I see him as my big brother, not a loser. I’m not Christian, but I believe in the seven deadly sins. Ignorance is as dangerous as greed and envy. Unfortunately, people’s understanding towards mental health is still low in Japan, especially among older generations. To older (and mostly male) members of my family and relatives, my brother has been and most likely will be a black sheep and they will treat him like one. Ignorance leads to discrimination. This is why we need to raise the awareness towards mental health. Try to be there and listen to those suffering. You might not be able to cure them but your understanding can cast sunshine onto their grey clouds.